How Long Can a Betta Go without Food? 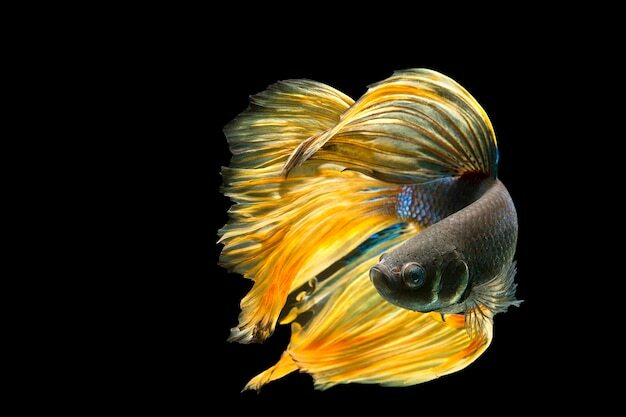 Betta fish is very enjoyable because they look beautiful and aggressive. It is noticed that betta fish does not require to care too much. There are reasons why the busy people choose to keep them. Yes, even so, you cannot skip them. Basically, you should know the exact answer to the question: how long can a betta fish go without food? This one is very useful for those who are too busy at the office or school. See all right now! As mentioned in my previous article (how often do you feed a betta fish? ), you have known that the betta fish needs to be fed twice a day. And of course, you are allowed over that number. Aside from that, I also recommended you to feed a sufficient amount of the food, instead, too much. You should know that the foods will be sunk at the bottom of your aquarium once your betta fish do not untimely eat them. On the other hand, overfeeding is a not-small problem of any fish, not only betta fish. According to the recommendation of few experts, you ought to skip 1-2 days in a week – don’t feed your betta fish. This one is helpful for their digestive system, which can regroup or calm down at a certain time. Don’t mistake! The given number above does not include the likely-survived time without food of the betta fish. In fact, during 14 days ~ 2 weeks, your betta fish can still go despite not having the food. Nonetheless, it does not mean that you can skip your betta fish throughout 14 days. Whether they do not die, the malnourishment capacity is of course. If you only miss a couple of days, no problem. There is not the end when you feed them regularly. A good suggestion for those who often go away one more days. You can look for the type of the food that is available programmed. This food will automatically release at a certain time. From there, you avoid worrying about skipping your betta fish too long. You should know that betta fish is very sensitive, so they will be affected once the living environment changed. It makes them stress and leads to stopping to eat. Frequently, this one will occur when you change the parameters of your betta aquarium, changing the large water, for example. Therefore, to maintain the betta fish’s appetite, let keep the stability of the water parameters, by cycling the fish tank yours. Not all betta fish like eating the new foods. Your betta fish can prefer one type of the food to others. In general, bettas will not eat the foods that they do not like. To determine what type of the food your betta fish want, feed the different foods. With the types that your fish do not like, remove them out of your aquarium 10 minutes later. Try this within few days to get the exact result. Due to being the cold-blooded animal, the beta fish is easy to get the effectiveness of the water temperature. For the bettas, the right temp is approximately 80 degrees F.
In the warm-water condition, your betta fish will quickly metabolize in comparison with the cooler one. If you recognize that your betta fish does not eat in many days, you should check the problems above. At once, you should also observe others, which can relate to the disease, lethargy, bloating, parasites, clamped fins,…, for example. If you are in doubt about the illness of your fish, let overcome the causes immediately. Frequently, it is possibly due to the strain environment unless there is the sign before accepting the food. To make sure the health of your betta fish, I have some tips if you intend to go away few days. Ensure your aquarium covered because the betta fish can jump out. Make sure all things working well. Attach the filter container so as not to worry about your betta fish that is sucked up. If had a heater, you should set it at the relative temps. Avoid your aquarium out of the sunlight, especially, in the summer months. All in all, the betta fish can survive during 2 weeks without food, but no one applies that actual number to the fact. And you do not also try. As said above, the betta fish will have some problems if they do not eat too several days. I recommend that you should only skip the maximum – 2 days. In case your fish stop to eat though you still feed them regularly, you ought to consider the signs that I shared. Finally, I hope that you will not be difficult to answer the question: how long can a betta fish go without food? Happy growing enjoy!! !